Liminal states :: Patriot Act renewal: Time to make some noise. Fortunately, there’s an app for that! 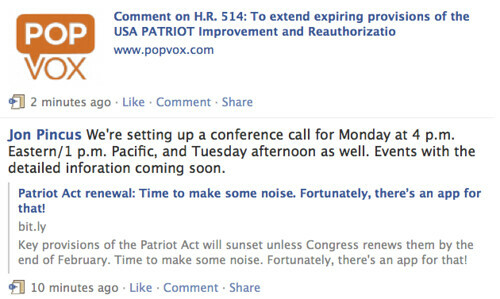 Patriot Act renewal: Time to make some noise. Fortunately, there’s an app for that! Update, February 11: The House will be voting on HR 514 again soon. Keep making noise! Shahid Buttar’s Demand JUSTICE for the PATRIOT Act has the latest. Key provisions of the Patriot Act will sunset unless Congress renews them by the end of February. The Obama Administration is working with its allies in Congress to extend Bush Administration policies including National Security Letters , “sneak-and-peak”, and warrantless wiretapping. On February 8, the House unexpectedly stood up and defeated HR 514, which would reauthorize the odious clauses until December. It’s back for another vote, though. With there are three bills in the Senate, and Congress is on recess the last week of the month, it’s not a pretty picture. Time to make some noise. Fortunately, there’s an app for that! Or more accurately, there’s a website for that. POPVOX’ tag line is “share your opinion with Congress and the world” and it’s causing a lot of buzz in the non-profit technology community. Nancy Scola’s Can We the People Use the Internet to Make Congress Smarter? on techPresident describes how POPVOX makes it easy for individuals to share their views with their legislators, and for advocacy and educational organizations to share their perspectives and get their members involved. So visit the POPVOX page for the bill they’re likely to be voting on in the House: H.R. 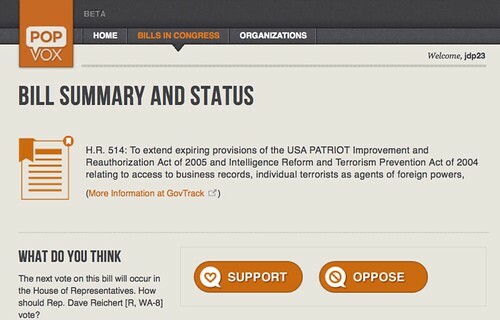 514, aka To extend expiring provisions of the USA PATRIOT Act Improvement and Reauthorization … You can get details about the bill from govtrack, or if you already know how you feel about it you can just click on oppose. At this point, you can add a personal comment if you want; or you can decide to go back and do it later. Next, the system asks you for your name and address to route it to the correct legislators. 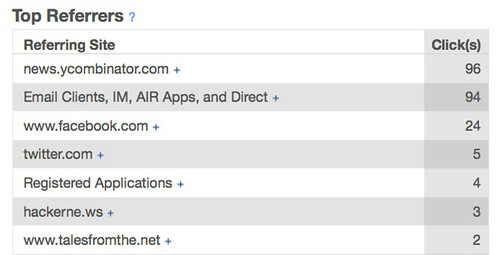 Once you click send, it’s easy to forward the link on to your friends and relatives using Facebook, email, or Twitter. It’s similar to the change.org and Care2 petitions we’ve done in the past, with the big advantage that it’s been designed to make it easy for congressional staffers to report on the feedback they’re getting and so increase the chances that our messages are heard. Quick privacy note: POPVOX requires your real name and address in order to communicate Congress. When you sign up for POPVOX, you can choose whether or not you want your comments visible publicly and what screenname you want to use. I signed up using my Twitter account so I’m jdp23. POPVOX and Privacy has a more in-depth discussion. Of course the House vote on HR 514 is only the first skirmish. With bills from Leahy, Feinstein, and Grassley already in the Senate, there are likely to be fireworks. In 2006, 2008, and 2009 the battle over the Patriot Act and wiretapping went on for months. So let’s get started. In the short term, what we need to do is get a lot of people to visit the POPVOX page, sign up, and click a few buttons. Fortunately, this is Get FISA Right’s core competence! Write clear instructions with screenshots on how to use POPVOX to oppose H.514 and all three of the Senate bills, and a short easy-to-understand summary of all the reasons we shouldn’t just blindly extend the Patriot Act without debating it. Ask members of the coalitions that have opposed Patriot Act renewal in the past to join us by letting their members know that the vote is coming (blogging, tweeting, action alert) and providing a link to a page where people can contact their Representatives. Reach out broadly: libertarian and progressive groups, privacy and civil liberties organizations, past allies from Ideas for Change, etc. Work with journalists who have covered us in the past, and sites like Global Voices, Foreign Policy and Al Jazeera who have a deep understanding of social network activism, to begin priming the pump media coverage. In parallel, kick off an Op-Ed program similar to the ones we’ve done in the past and get time on talk radio shows. Later this week, after the House vote, we’ll shift our focus to the Senate, starting with Thursday’s S.193 markup. We will probably want to formally launch a campaign — multiple simultaneous blog posts, emails, action alerts, a PR firm to help with media outreach, a press call … all that good stuff. We’ll also want to find partners to lead phone, email,and petition campaigns. POPVOX is only one way of communicating with Congress, and we want to hit them on multiple channels. Other organizations have far more resources and experience with those areas than Get FISA Right. For now, though, let’s concentrate on HR 514. There’s a lot to do, and not a lot of time. In the short term, the most important action you can take is to ask your Representative to oppose HR 514 — via POPVOX, on the phone, on their Facebook page, all of the above! If you run into problems with POPVOX, please let us know: we want to discover problems now before things really start cranking. Then tell your friends — on Facebook and MySpace, via Twitter, in email, and even (gasp) face-to-face. If newspapers are more your style, start working on a letter to the editor or even an op-ed piece with a personal or local focus. Call your Congressperson! And there are email campaigns from Demand Progress, ACLU, EFF, Downsize DC, and others. Take a few moments to customize your mail and add in a personal touch. 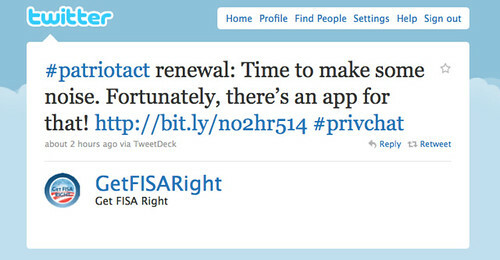 Get FISA Right has a planning conference call/chat tentatively scheduled for Monday at 4 p.m. Eastern/1 p.m. Pacific. Please join us! Details coming soon on the Get FISA Right blog. The Patriot Act is likely to be on agenda for a few minutes during the Twitter privacy chat on Tuesday at noon Eastern / 9 a.m. Pacific. It’ll be a great chance to engage the privacy community and businesses who see privacy as important. You can follow along whether or not you’re a Twitter user. We’ll reconvene online and on the phone on Wednesday to talk about what next. The #patriotact hashtag will probably be the best place to follow what’s going on. I like the interface at http://getfisaright.twazzup.com/ or you can use any Twitter client. We’ll also get updates out via the blog, our email list, and our Facebook groups — and encourage others to do the same. Posted by jon on Sunday, February 6th, 2011, at 9:45 am, and filed under political, Tales from the Net. Thanks for letting us know about this. I will start putting together an op-ed/blog, including getting together some links for talking-point resources (though I have a pretty busy weekend planned, I should be pretty well started by our conference call). Looks as though you have the POPVOX instructions pretty well done. What I’ve got here is a good start for the POPVOX instructions but it’d be great if somebody could make them into a standalone page, clean up the design, and highlighting where people should click. We want to get something that it’s easy for advocacy groups to repost on their own site, tweaking it however they want. If you’re on Facebook, you can help get the word out by liking and sharing the posts on Get FISA Right’s wall. Join the group if you’re not a member already; click on Like on both the wall posts; and then click on share to send them out in your feed as well. Short and to the point, highlighting a reason for using POPVOX: the information will actually go to the Congressperson. Usually it takes me a couple of minutes to write a good short comment the first time I do it. Then I cut-and-paste it and put it in a Textedit or Notepad window that I leave up. Next time there’s a post to comment on, I’m starting from a much better place — I can use my previous comment directly, or tweak it a little to make it fit better. And if you see somebody else’s comment, it’s a great opportunity to jump in and reinforce their point. Here was my reply. As of this morning, at least 330 people had visited this post by following the http://bit.ly/no2hr514 link. The biggest single source of traffic is a short comment I left on Hacker News (aka news.ycombinator.com) in Who else is hacking a project instead of watching the Super Bowl?. Twitter’s contribution is underestimated here; clients like Tweetdeck that are written in AIR get lumped in with email and IM. Meanwhile on PopVox, 30 people have voiced an opinion — so far, unanimously against the bill. This is a encouraging start: a “conversion ratio” of 10% from a post this long with a multi-step signup process isn’t bad at all. Still, there’s plenty of room for improvement. What are the things we could do to get a higher percentage of people who read this post to send a message to their Congressperson via POPVOX? And as we shift our focus to other bills, how can we do even better? The House vote’s tonight. Let’s make some noise, shall we? You can take action via POPVOX, ACLU, EFF, Downsize DC, or Demand Progress. And if you’re on Twitter, please tweet some or all of the following — or just check out the #patriotact hashtag and retweet whatever looks good! In a very rare confluence of events, the same subject led the conversation on both blogs and Twitter last week. And voices from both ends of the political spectrum were actually in agreement. Much noise was made, and it paid off. On February 15, the Senate passed a three-month extension; on the 17th, the House did as well. Julian Sanchez discusses why this is (relatively) good news.